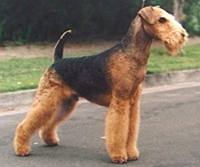 Airedale Terrier Dogs - The Airedale Terrier (often shortened to "Airedale") is a terrier dog breed originating from Airedale in Yorkshire, England, in the UK. It is sometimes called the "King of Terriers" because it is the largest of the terrier breeds, 50 to 70 pounds (23-32 kg). The breed has also been called the "Waterside Terrier", because it was bred originally to hunt otters. This information is licensed under the GNU Free Documentation License. It uses material from the Airedale Terrier article on Wikipedia.org. Airedale Terrier Breeders - Advertise your kennel puppies and dogs here.